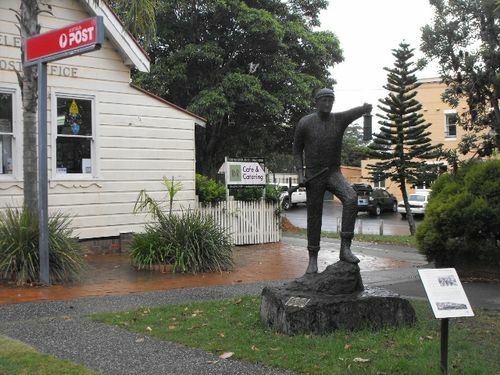 Statue commemorates the town's mining heritage. In 1883 Cumberland Coal and Iron Mining Company took a ninety nine year lease of 18,000 acres of Government land known as 'Camp Creek '. Coal was found in 1884 on the site where the mine is located today. The opening of the coal mine was responsible for the growth of the village of Helensburgh. The Metropolitan Coal Company of Sydney took over the mine in 1887 and opened in 1888 employing 45 men. This mine was described as the most perfectly arranged mine in Australia because miners were able to walk perfectly erect in contrast to most mines. It was also possible to use horses rather than ponies in the unusually high tunnels. The mine was bought by Australian Iron & Steel, Port Kembla in 1965. This mine has been closed and re-opened on a few occasions.